Discussion in 'Sega Dreamcast Development and Research' started by Mrneo240, Mar 13, 2019. Come on guys, has nobody from here any tips for the dude? There could be come precious unreleased game code on this devkit. Hopefully it is only a simple issue he has. Jesus, my wireless mouse was glitching out when I pressed reply, can a modorator PLEASE clean the duplicates up and this post too? Thanks. It's not clear what are the symptoms? Could you direct to a post in particular? The safest way to dump the HDD would be to remove it from the kit and plug it in a PC SCSI card for dumping with an imaging program like DD. @T_chan is our resident Katana expert. can a modorator PLEASE clean the duplicates up and this post too? You realize there's no staff anymore? So none of the mods come here at all anymore? I know Kevin is not here, but every mod? Admins and mods are a bit different so that is why I assumed there were at least mods here. Only Kevin's left with moderating powers. I personally hope he will come back in time. Maybe I should've accepted a moderation position when he offered me one, so there'd still be one mod left. arnoldlayne, Mrneo240, truemaster1 and 2 others like this. Yeah, I was just thinking I might want to be one too providing I have the time. I moderated TIZ from 2009-15 so I have experience. He should have let people who really care about the site do it for sure. You would make a good mod here. You are pretty much here every day or close to it from what I have seen. Mrneo240 and darcagn like this. Juuuuuuust in case, seeing there is no mentioning at all..... for the owner it might be wise to disclose what the machine DOES do when powering-on. Hello, how are you? I've been looking at the thread on assemblergames that you made about my dev kit, and I want to give an answer so you can post it. The problem is: The sega katana turns on fine, the 3 lights of operation turns on in order, I can hear the SCSI Hard Drive spinning, the same to the GD-ROM drive. The problem is that I don't get any video signal. What I tried: 1) I set dip switches 1, 2 and 4 up, rotary switch to 0 and of course, slide switch on left in order to run the self-test mode and I connected sega katana with VGA cable to my monitor and I didn't receive any video signal. 2) I tried other video configurations of dip switches like output rgb video signal and nothing. What sould I do? Is there a way to do a recovery via the Adaptect 2940 SCSI card? 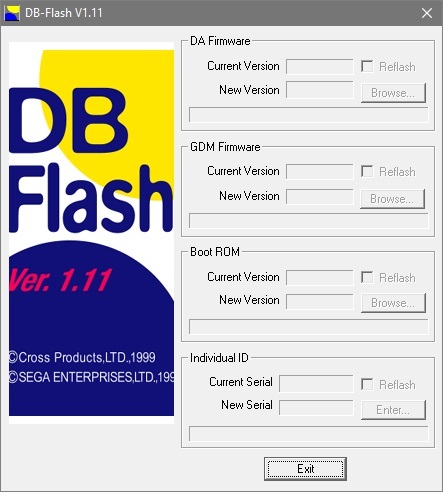 And how I reflash the system? MastaG and Anthony817 like this. I would just like to state that I picked up a katana from pitsunami with this same exact issue. I was hoping to try a reflow on it, but the system is much more complicated than I thought and I really don't want to risk a "general" reflow for what *might* be a dry solder joint. I've tested the system with various dip switch configs, such as vga out or test mode, neither output video for me. I've reached out to the redditor, he gave his discord on that thread as well. Maybe his is as simple as hooking it up to a win98 vm and switching it from emulator mode. Looks like the Katana is configured in CPU Mode. Click here to know how to switch in OS Mode from CodeScape Debugger. By the way, is the Katana visible through the Adaptec SCSI card? 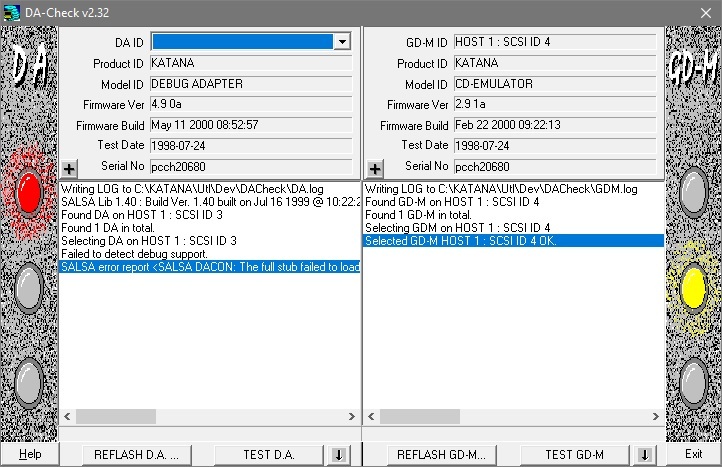 Two SCSI devices should be visible when starting up the computer, GD-M (HDD) and GD-DA (the Katana itself). The user should see a removable drive in the Windows Explorer when the Katana is powered on. 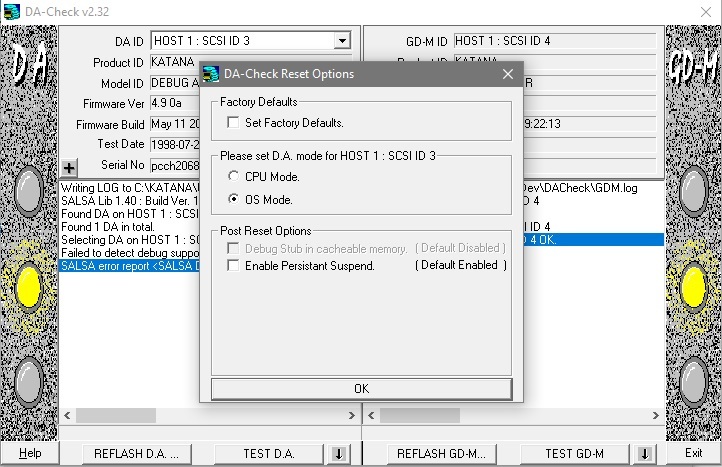 If not, may be the HDD is dead, to debug that, look up to the Adaptec log shown when starting up the computer. 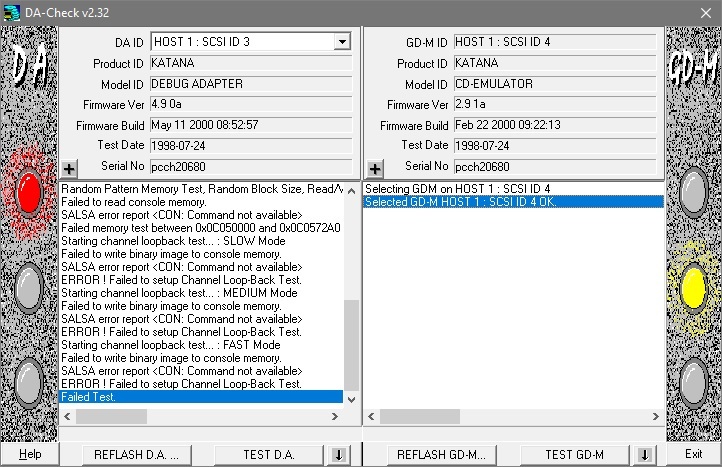 The Quick Start guide included in the official SDK (like the R11b or R10) contains valuable information on the Katana setup, maybe you'll find what's wrong here? I got PMed by him on Reddit, already told him to switch to OS mode. Don't think he's done it yet. SiZiOUS and Anthony817 like this. So it seems he is having issues with the DA. 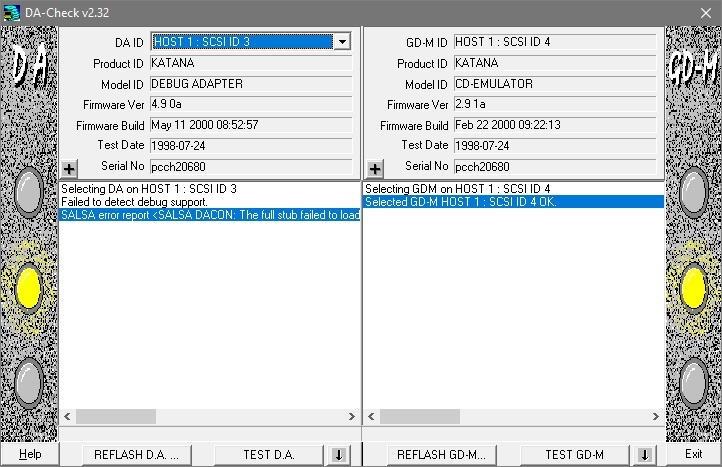 The GDM is fine, and the DA is connecting properly, but it returns an error that "The full stub failed to load". I recall somewhere in a manual a solution to this problem. Anyone recall what the stub is? I feel like it's the debug information sent to the DA by CodeScape, isn't it? Does he have the proper SCSI card on his computer? I remember the recommended one being an Adaptec 2940. Is it properly terminated? It is properly ocnfigured? What OS is he using? @T_chan wrote a nice post about using the SDK on Win7 (should work on Win10 I guess), he even wrote a nice ASPI dll for that purpose (mekugi). Seems like it. He's tried on a Win98 pc with the same result. Considering version information is coming down the pipe, it seems to be something specifically with the DA. Karl (guy who has this katana) asked me to post this for him here. then I installed the official Katana R11b SDK. My take from this is that the SH4 side of things is completely dead. Even if the boot ROM is trashed the DA should be able to take control of the SH4 to reflash it (this is why it's normally impossible to completely brick a Katana) - but it looks like the DA can't talk to the SH4 at all. I would be looking for drastic stuff like missing power rails or clock signals.